Can You Bake Doughnuts Instead of Frying Them? When it comes to baking, I'm an experimenter. 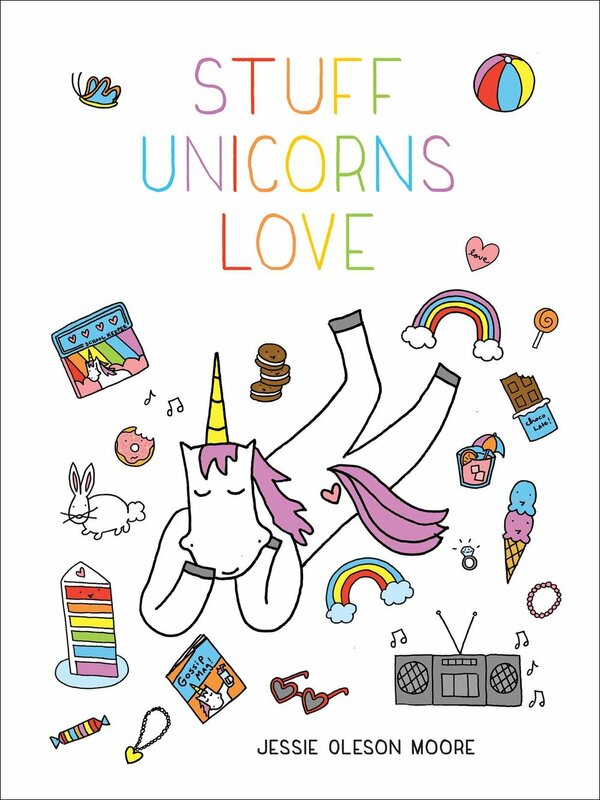 How 'bout you? 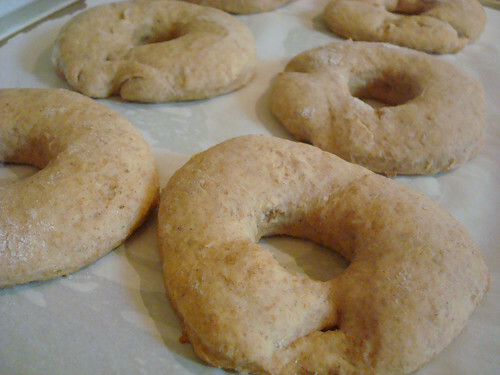 To set the scene for you: I was making some tasty apple cider doughnuts for my most recent Craftsy entry. Gosh are these things good. 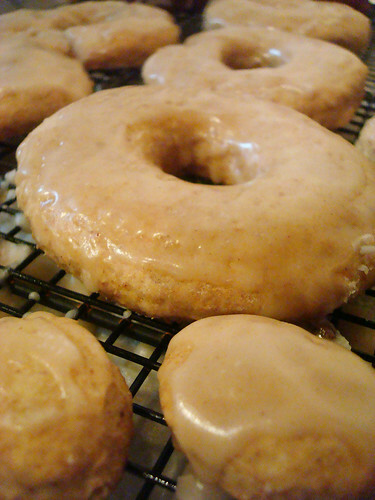 To make them even more apple cider-y, I made a glaze that had apple cider in it, too. They really came out splendidly. But I wondered, as I was cutting out the doughnuts for the third or fourth batch of frying three at a time, "what would happen if I baked these puppies?" so I decided to give it a try. I set the oven to a temperate 350, placed some pre-cut doughnuts on a baking sheet, and popped it in the oven. 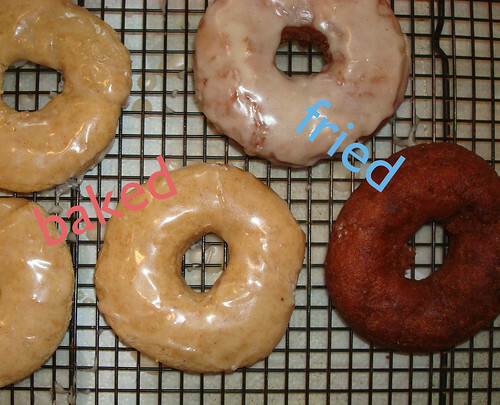 To give more of a comparison, here's a side by side with a baked and a fried doughnut. Same exact dough, two distinctly different end results. So how do they stack up, flavor-wise? Short answer? They taste good. But in terms of a comparison? That is tougher, because they are more different than you'd think, based on the fact that the only difference is the cooking method, and I used a flavorless vegetable oil. Here's a picture which features a few variations: top, a fried and glazed doughnut, then going clockwise, a fried doughnut unglazed, then a baked and glazed doughnut. The baked doughnuts are tasty, but if you did a blind test, you'd never even guess they're a doughnut. They kind of have the texture of a Starbucks scone--you know what I mean when I say that, don't you? Sort of like a slightly coarse, sweet bread? Pleasant enough, and they tasted like they'd be great with cream and jam, or lightly buttered. But they weren't as much of a stand-alone indulgence as the fried doughnuts. They were more like lightly sweet apple biscuits. Once I added the apple cider glaze, however, they were more of a stand-alone treat. 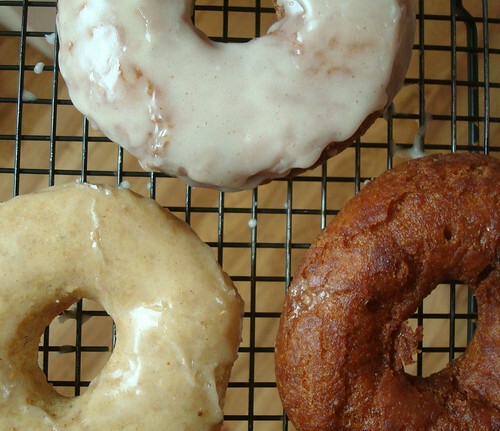 If you're looking for a healthier way to enjoy doughnuts, you might want to give it a try. They don't taste exactly like a doughnut, so I won't make that claim, but they don't taste like suffering. As a final observation, the baked version seemed to keep better (especially when glazed). 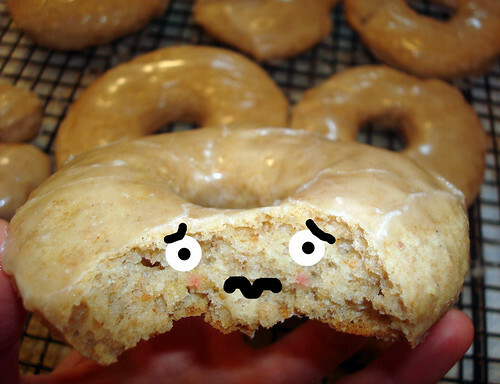 You know how a fried doughnut that is more than a few hours old just starts to taste sad? That didn't happen with the baked version--they maintained their flavor for at least a couple of days at room temperature, whereas the fried ones had to be frozen to keep well. 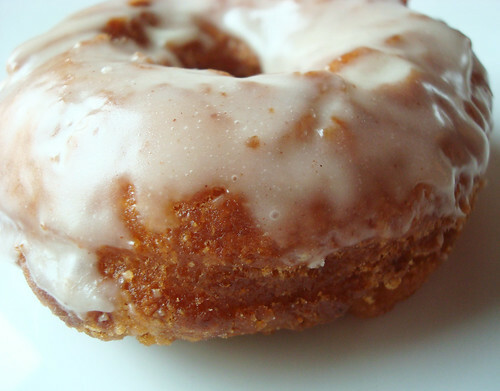 If you'd like to see the doughnut recipe and try baking them for yourself, visit Craftsy. 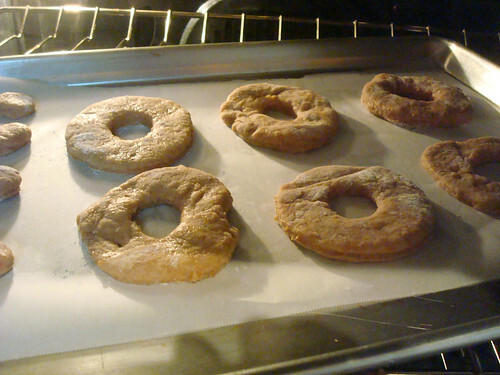 But instead of frying the doughnuts, bake them in a preheated 350 degree oven for about 20 minutes, or until golden. Baked or fried...enjoy! What's your most recent baking experiment?